“Pedigree” is a term used by genealogists, referring to family lineage. Penn High School senior defensive back Jackson Weston has a Gold and Black pedigree — he represents the third generation of Westons to play football for the Kingsmen. Both his grandfather, Jerry, and father, Mike (who played on the 1983 state championship team in his freshman year) played on the defensive line, while Jackson has roamed the secondary from the cornerback position for the last four years. One would think that being the third generation in a family that has been doing anything for two generations would come with a certain amount of pressure, but for Weston, that hasn’t been the case. The gridiron isn’t the only place Weston has excelled in his high school career. A two-sport athlete, Weston has also run track for the Kingsmen since his junior year. From an early age, Weston took it upon himself to learn as much as he could from his family members who fought for the Kingsmen before him, and he’s applying those lessons to his life today. “The most important things they taught me were to never quit and the value of hard work,” Weston reflected. Those values are especially crucial these days, as Weston recently return to act for the playoffs after suffering a fractured hip. As any injured athlete would tell you, the worst part of being injured is having to watch the team play from the sidelines. It’s been no different in Weston’s experience, but he’s taken the change in stride, drawing the attention of his coaches. 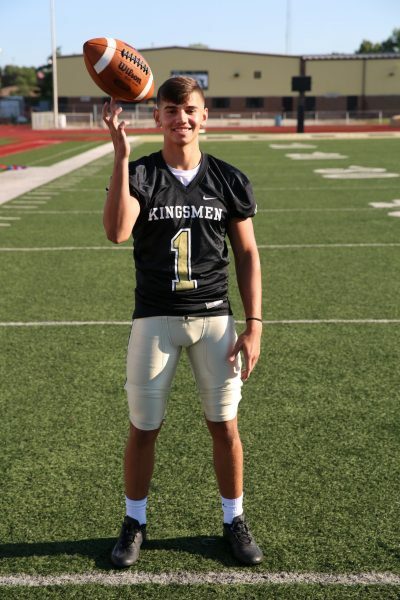 Even though Weston the end of fall this year means that Weston is going to play his last games of high school football for the Kingsmen, Weston is certain it won’t be the last time a Weston puts on the black and gold. “If I have a son, he’s definitely going to play football here,” he said without hesitation.